Chicken Parmesan is a favorite dinner in the Just One Donna house. It's also a favorite restaurant menu choice. 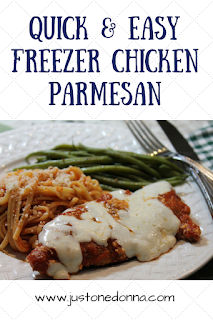 I like to keep Chicken Parmesan prepared in my freezer for those busy weeknights when we might be tempted to head to a restaurant instead of eating at home. That way, we'll have a delicious dinner all ready to go into the oven, and save money to boot. What's not to like about that? 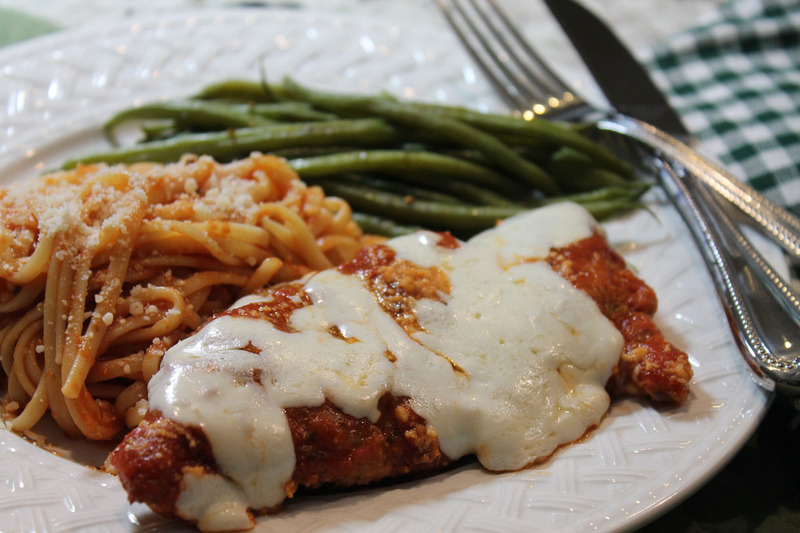 This Chicken Parmesan recipe is made with readily accessible ingredients in the spirit of semi-homemade. You may already have the ingredients you need in your pantry. That makes this an easy recipe for any mom or dad to prepare in advance for those busy weeknight dinners. 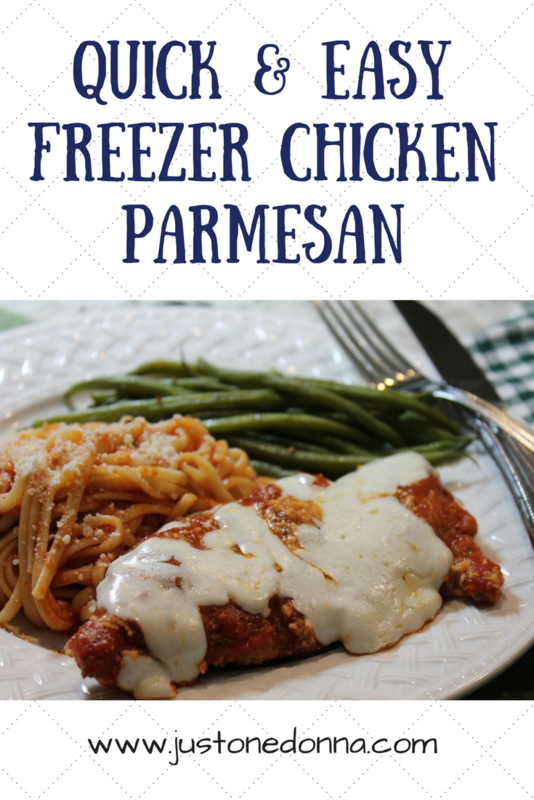 Make a double batch and you'll have a baked Chicken Parmesan dinner for tonight and another one for the freezer. 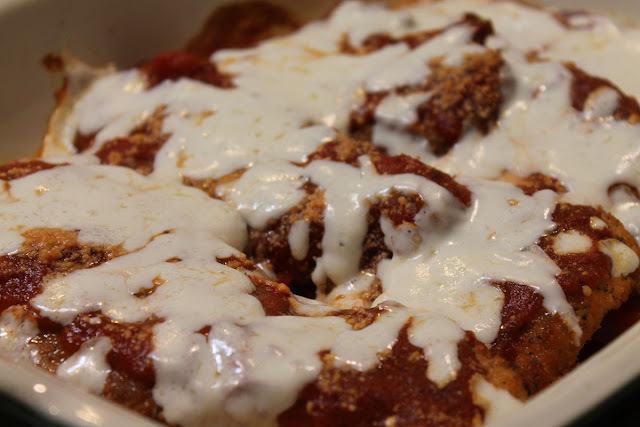 I like to use ceramic or glass dishes when I freeze my chicken Parmesan. Pie plates work really well, as long as you won't be needing them for baking pies. Pound the chicken breasts between double pieces of plastic wrap. Pound using the flat side of a metal meat mallet. Cut each breast in half and set aside. Break the egg into a pie plate. Add the water, salt and pepper and mix to combine. Place the chicken breasts in the egg mixture to coat. On a plate, mix together the Italian seasoned bread crumbs, Italian seasoning, and the grated cheeses. I like a 50/50 mix of bread crumbs and cheese. You may want to adjust the mixture. Using one hand, coat both sides of each piece of chicken in the bread crumb mixture. Heat the vegetable oil in a large frying pan, over medium-high heat. Once the oil begins to shimmer, add the breaded chicken breasts. Cook until one side is browned. Turn the chicken and continue cooking until golden brown. Remove to a plate lined with paper towels. Coat the bottom of a baking dish with the prepared tomato sauce. Add the breaded chicken breasts. Top each breast with additional sauce and the shredded mozzarella cheese. Cover first with a layer of plastic wrap and then a layer of aluminum foil. Refrigerate or freeze until ready to cook. When ready to cook, preheat the oven to 350 degrees F. If you use a high quality plastic wrap you don't need to remove the plastic wrap. Bake for 45-50 minutes, until bubbly and heated through. Serve with your favorite pasta and a green salad. Follow my Chicken Pinterest Board for more yummy chicken recipes. Thanks for sharing this post on Facebook, Pinterest, Twitter, or Yummly. This is one of my favorite meals but I have only attempted to make it once. This post has reminded how good it is, I'm adding it to my meal list for next week! Thanks! This isn't a difficult or very time consuming recipe to make. Using jarred sauce makes it even easier. When you have the time, making your own homemade sauce will make it extra special. You bake it in the oven WITH the plastic wrap still on? Oh yes, you can leave the plastic wrap on under the aluminum foil up to 400 degrees F. It holds the steam in even better than the aluminum foil alone. That makes my Chicken Parmesan tender as can be. The cheese will be all melty-gooey and YUMMY! Try it. can you make this a day ahead? Yes, you can make it a day ahead. Cool it and refrigerate. It will take less time to heat through from the fridge than the freezer. Should the chicken be cooked all the way through and cooked fully when browning? I find that my chicken cutlets are usually cooked all the way through from the frying. I don't fret about it because of the additional cooking time in the oven. If not frozen, just refrigerated...should the cooking time be shorter? seems that 45 minutes will overcook chicken. Well, I thaw my frozen chicken Parmesan before cooking it in the oven, so 45 minutes usually works perefectly for me. You might want to check yours at 30 minutes. Should the chicken be cooked fully when browning, or remove after outside is golden brown? I like my cutlet to be thin so they are always cooked through by the time the coating is nice and brown. The key is not to let your oil get too hot. If the oil is too hot the coating will brown too quickly. I'm making this dish for 100 people at my church. All they have are very large aluminum trays to use. Will this work and do I need to make any adjustments? I'm sorry, but I've never made this for more than 8 people. My suggestion is to talk to others who have cooked for the church in large quantities for an answer based on their experience. Will you be cooking in your home oven or a commercial oven? Will you be cooking from frozen or right after prepping? Will you use a single layer of chicken or multiple layers? These answers will make a difference. A completely thawed pan of chicken, with the chicken in a single layer should take the same amount of time to heat through in an oven with an accurate temperature setting as indicated in the recipe, but like I said, I haven't cooked for 100 before.